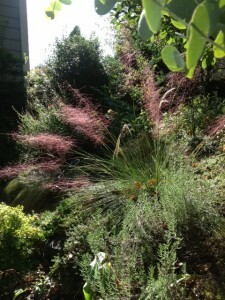 Muhly grass, muhlenbergia capillaris, is a native grass that is quiet for much of the year until mid-October-November, when 4′ panicles of pink blooms float in the air – if you can site it where it is backlit by the sun, it is a sight to see! One of the best places to see this fantastic grass is at Railroad Park downtown. There they’ve utilized it in masses, and when the light is right, it’s a haze of pink everywhere you look – it’s absolutely stunning. If you’d like to try some of this in your own landscape or containers, we have some in stock now – we warn you though, you might walk right by it in the nursery and think nothing of it. This is one grass you have to plant for its future beauty! Requirements: Full sun to part shade, with moist, well drained soil – though it will tolerate drought and heat once established. 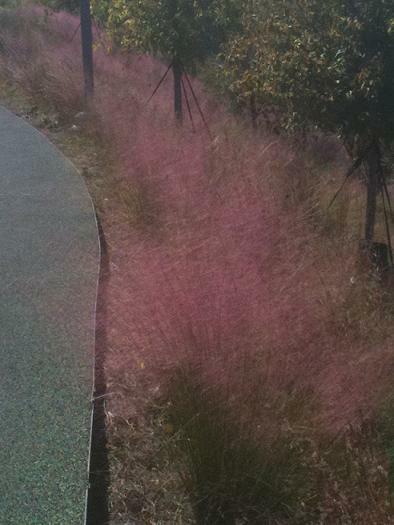 This entry was posted in Fall, Perennials and tagged muhly grass, perennial grass, pink blooming grass, Railroad Park grass on June 1, 2013 by Kris Blevons.